Yesterday I saw my OB/GYN and he could feel my lump and we scheduled a mammogram on Friday. Good news is that he thinks it is a cyst. What's a girl to do after a day of teeth grinding? Go to a Sieze de Mayo party (held on the 6th - get it?). A few margaritas and some good food made life that much better. 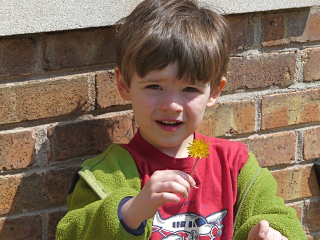 Here's Aidan doing one of the sweet things that I love about him - picking me a dandelion to wear in my hair. When I take my ponytail out at night, a limp reminder of his sweetness falls and I never want age 4 to end. But it will - 5 is just 3 weeks away. Thank you everyone for your kind words. Sorry for my pessimism. As Jennifer says, sometimes you can be your biggest obstacle. What a cutie pie! Tell Aidan my "garden" has beautiful dandelions to pick! Good luck tomorrow, my friend! I'm so relieved and happy that all is going to be well. And what a sweet little gift for you from young Aidan--a flower for your hair. margaritas do make things seem better, don't they? I'm glad the dr. had some good news for you and today is looking better!